Expectations are sky high for the Davidson Wildcats following their 2017-18 A-10 tournament championship, with the squad routinely being pick anywhere between first and fourth heading into the season. Those high expectations are largely due to people placing faith in star Kellan Grady along with the steady hand of Bob McKillop at the helm. However, when you dig into Davidson’s roster, there is plenty more to be excited about but also a fair share of unknowns. Davidson only returns one senior—Nathan Ekwu missed last season with knee trouble and redshirted—and is losing four seniors who were either starters or consistent rotations players, including the co-player of the year Peyton Aldridge. In some respects it’s surprising that Davidson is being picked so high considering their losses and the fact that Kellan Grady notwithstanding, their recruits often receive less national attention than other teams and they have no incoming transfers. From Davidson’s perspective, that’s just fine, as the team is ready to reload surrounding their trio of Grady, Jon Axel Gudmundsson and KiShawn Pritchett. Here are Davidson’s keys to success heading into next season. So much of Davidson’s success will depend on the continued growth and consistent play of Grady, Gudmundsson and Pritchett. Grady starred as a freshman, and if he takes a leap as a sophomore, he will be in the conversation for All American teams. 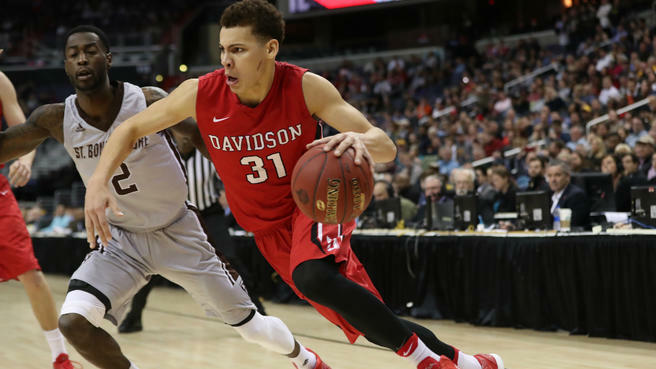 He enters the season as one of the leading contenders for A-10 player of the year, and if he steps up to the plate, Davidson will be in great shape. Jon Axel Gudmundsson has a case for toughest player in the A-10, but beyond that, he has developed into the ultimate stat-line stuffer. While he averages over 13 points per game, he is also one of the best rebounding guards in the country and led the team in assists last season. Gudmundsson will be one of the three primary ballhandlers for Davidson but may find himself off the ball more as Grady steps into the point guard role, so it will be extremely important that he maintain his quality three point shooting of over 40% while doing all the little things that the Davidson coaching staff adores him for. As Grady becomes more aggressive and Gudmundsson continues to fight like crazy on the court, it will be Pritchett’s job to calm everyone down and run the offense when things get out of hand. Pritchett understands the offense perfectly and can get people into the right spots when things start to go south. With this, his ability to make sensational passes and continued three-point shooting success, he will have to be Davidson’s stabilizing force. With two huge holes to fill in the starting lineup, one of the replacements will be obvious to those around the program and may be surprising to everyone else. Even with Kellan Grady’s top-100 prospect pedigree heading into last season, guard Luke Frampton was receiving an equal amount of buzz as a future face of the program. Fans were devastated to hear that he tore his ACL in October, as Frampton was slated to start and be a terrific complement to the veteran-laden roster. If Frampton’s recovery continues as hoped, he will be an impact player this season. Even though he never received much love from national recruiting websites, Frampton has plenty of prospect pedigree: he was the Gatorade Player of the year out of West Virginia and received offers from programs such as Arizona and Memphis. While primarily viewed as a shooting specialist by these programs, Davidson expects him to be an all-around stud who spreads the floor while playing off of the established guards. The second spot is harder to pin down heading into the season, but smart money is that top recruit Luka Brajkovic wins the job out of camp. Other possibilities include Nathan Ekwu and Dusan Kovacevic, but considering both will be coming back from nagging injuries, the job will be there for Brajkovic if he is ready. Brajkovic is an Austrian sensation who chose Davidson over the likes of Stanford, Purdue and Penn State. He is tall, long, and skilled, with a developing perimeter game out to the three-point line. He might be a bit raw during his first season and may have trouble with the speed of the game, but he has been a productive player on the international level while making significant strides every season. At the very least, Brajkovic will provide Davidson with much needed length around the rim and an ability to finish at the basket in the post and off dump off passes. In addition to Frampton and Brajkovic, Davidson will be relying on additional freshman to step into rotation minutes right away. Guard Michael Jones is a freshman who may not be respected nationally, but in Minnesota hoops circles is one of the most feared shooters and scorers in recent years. With long arms and a crafty game, Jones’ team relied on him heavily as he used his off-ball skills and shooting ability to put up monster games against teams laden with Big 10 prospects. Davidson has lacked a scoring punch off the bench in recent years, but Jones will be ready to come in and stretch defenses right away. Expect him to have some games similar to Taylor Funk last year where he goes off and puts the fear in defense for extended periods of time. Nelson Boachie-Yiadom comes from Great Britain after spending the last few years at Loomis Chaffee in Connecticut. Boachie-Yiadom may never average more than 10 points per game, but he is tall, long, athletic, and most importantly a smart basketball player who makes his team better whenever he is on the court. He may need to add muscle to handle banging with other A-10 bigs, but he has a package of skills that allow others to succeed while he does the dirty work to help the team win. The younger brother of former Wildcat wing Chris Czerapowicz, David is a tough player who has the ability to get extremely hot from three-point land. The consistency of his jump shot as well as his ability to handle the offense from the point guard spot will determine how much he plays early on in his career. As far as his shooting ability, IQ and toughness, the younger Czerapowicz fits the mold as a classic Davidson guard. With a rising sophomore who played limited minutes and two upper class big men returning from injury, Davidson has the potential to receive major contributions from players already on the roster. Entering his second season Carter Collins has the potential to make as much of a jump as anyone on Davidson’s roster. One of their rare elite athletes, Collins is incredibly explosive with a solid handle and jump shot, but the game appeared to be a bit too fast for him last season. With an offseason under his belt, Collins has as much raw talent as anybody on Davidson’s roster and could become a household name. After missing last season because of knee trouble, Davidson will need Ekwu’s superior toughness, inside presence and veteran leadership this coming season. An elite rebounder and shot blocker when healthy, Ekwu was extremely missed early last season and Davidson hopes he can come back at full strength. If he is 100% he could be the favorite to start, but considering the nature of his injury the team might want to monitor his minutes and let him play as hard as possible off the bench for shorter spurts of time. Dusan Kovacevic has become an enigma of sorts in the Davidson program, as a player with elite size, skill and footwork, he has fought injuries his entire career. A highly touted prospect coming in, Kovacevic needs to focus on getting healthy before Davidson should worry about how he fits in their scheme, but there is no doubt a healthy Kovacevic would be a huge plus for the Wildcats. In many ways he is exactly what the team needs in the starting lineup, and he could easily vault himself into that position, but there is no sense in rushing him considering the injuries he has dealt with.